Hello!! Today, we are about to show you some easy and important steps on how to grow succulents indoors. Why indoors and not outdoors, you may wonder? Well, you may have read dime a dozen stories and articles about outdoor growing of succulents, but very few of you would have come across pieces that have covered growing them inside houses. The ever so popular succulents are not difficult to grow indoors, quite contrary to what most of you believe. Rather, these can grow wonderfully well provided you follow some steps diligently. Succulents are easy to maintain houseplants that need low humidity, less watering and moderate sunlight. These plants are hardy and can withstand neglect on your part. Apart from looking artistic and attractive, succulents are adorable gift items that anyone would love to have. One can grow them nicely in containers and also further their growth by propagating in different ways. So, let’s go ahead and see how you can grow these darlings indoors. These fleshy looking plants are typically grown in arid climates. These find place in almost every home – on fireplace mantels, on coffee tables or at corners. Here are a few easy steps on growing succulents indoors that will encourage you to choose these babies over other houseplants any-day! 1. Before you start planting succulents indoors, you have to choose the right kind of pot or container. 2. Preferably, select a pot that is neither too small nor too big in size and has holes at its bottom. This is needed to drain off water as succulents can die in conditions where they are over watered. Use an un-glazed pot, preferably clay for best results. 3. After you have chosen your pot, fill its 1/3 rd with gravel, and follow it up with 2 inches of rough sand. 1. In the second step of growing succulents indoors, you have to prepare the potting soil which will form the medium of growing the plants. 2. When you are planting succulents in pots and want to keep them indoors, the potting soil chosen has to be nutrient rich. It must be such that water drains off completely and doesn’t clog the soil. Markets are flooded with soil mixes that are favorable for succulent growing. However, if you don’t have a store bought mix, make your own by mixing equal parts river sand and garden soil and two parts of leaf mould. 3. All the ingredients have to be mixed thoroughly before putting it in the pot. 1. The prepared potting mix has to be filled in the pot till the desired level, say 2/3rd. 2. Very gently, plant the succulent at the middle and cover its roots. Using your fingers, press down the soil so that the roots get covered properly and are not left exposed. 1. Once you have prepared the potting soil and planted the succulents, its time to show them bright sunlight. Succulents love sunlight in ample amounts. 2. If you have a windowsill that gets direct sunlight, then place the pots on it. Some species like Rhipsalis can be considered one of the best indoor succulents as these do not need too much of sunlight as compared to other varieties of succulents. Showing sunlight is one of the most essential steps in every succulents plant care routine. 1. You don’t have to start watering immediately after you have planted the succulents. Wait for at least three days and then start watering. This is because if you water immediately after planting, chances are that the soil will get moist before allowing itself to heal from any damage that may have been caused to the roots during potting. 2. One has to take extra precautions in summer as it is during the hotter months that succulents grow. Therefore, watering has to be done twice or thrice every week to keep them moist and not overtly dry. 3. In winters, succulents rest and you need to water just once a week. Once the temperatures touch freezing point, one has to water only once in a month. 1. If your succulents are over watered, these in most likelihood will show discoloration. An over watered succulent looks too soft and has discoloration in its leaves that tend to go yellow. Some leaves also turn white. 2. Some succulents might turn brown and start to rot or decay if they are over watered. In case you see such signs, do cut away the decaying or dead parts like roots and then re-plant them in other pots with fresh potting soil. 3. If your succulent is under watered, then it will stop to grow and will start shedding its leaves fast. Also, some succulents also appear to have brownish spots on their leaves. 1. Once, you have watered, its time for fertilizing your succulent plant in order to feed it with nourishing ingredients. 2. However, summer is the month when you must start fertilization as it is during this season that succulents grow and thrive. 3. Winter is resting season for these plants and you must stop treating them with any fertilizer during this time. 1. Always choose a fertilizer having low nitrogen that can be used safely on succulents. 2. A low nitrogen fertilizer can be used on these plants in liquid form. 3. You can also safely go in for an organic based fertilizer having Eco friendly ingredients like cow dung, leaf mould and water. This can also be diluted with water and then used on succulents. Prorogation of plants is the ultimate step towards ensuring that your much loved greens keep growing and produce a rich harvest year after year. Succulents, like other plants too need to be propagated if you want to see their numbers growing and thriving. 1. Succulent propagation by seeds: Propagation using seeds is very popular and common. Succulents can be propagated using their seeds, but, one has to be careful to use the right and most sterile potting soil in which seeds will be planted. For best germination, use potting soil made of fine particle soil that is moist but not soggy or clogged. 2. 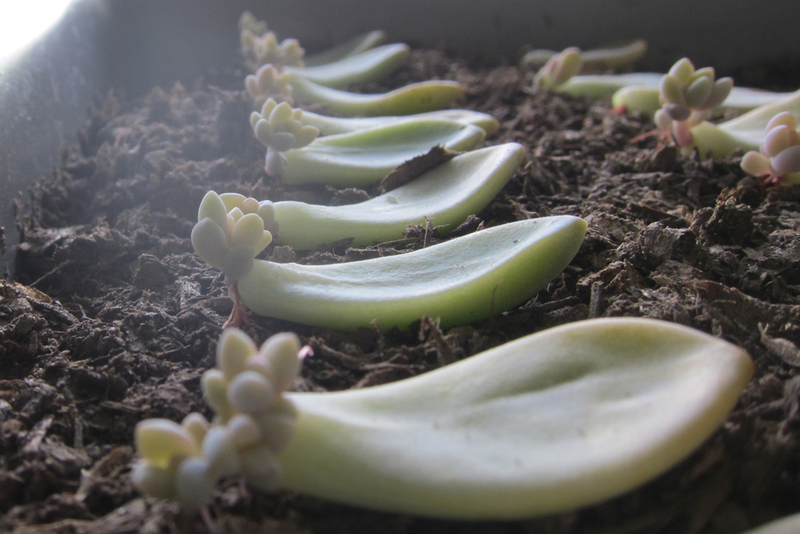 Succulent propagation by leaves: Its not merely seeds that can be used for propagating succulents. Leaves of these plants too can be used in the form of cuttings. While, this is also an option when you are growing succulents inside your homes, but, this method works only for certain varieties of succulents. 3. Succulent propagation by stem cuttings: This method makes use of stems for propagating. While, propagation using seeds and leaf cuttings are very common and easy, doing propagation using stem cutting requires a bit of expertise in gardening. 1. First of all fill the chosen pot or container with potting soil made out of fine particle soil mix. 2. Water the soil properly so as to keep it moisturized. 3. Now, scatter the seeds of your succulent plant all over the potting soil but keep enough spacing between each one of the seeds. 4. After a few months, you will see the seeds covered with top dressing. 5. Water the seed pan using a sprayer but only mildly. Then, you will see the seeds starting to germinate in two weeks time. They will look like green dots. 6. At six weeks, the seedlings start to need water less often. So, you need to water them every alternate day. 7. Once they reach a year or so, the seedlings can be transplanted to other pots or containers. 1. When using leaf cuttings to propagate succulents, you need to be careful so as not to break or cause damage to the stem when clipping off leaves from it. 2. After planting, you will see young and tiny plant growing at the base of the leaf. This will probably take place after you place your pot under some shade and wait for a month or so. 3. After plucking off the leaf, you have to plant it in some other place with soil that is porous for allowing proper drainage. 4. It will take weeks before you see plants growing, hinting towards the fact that your succulent plant is growing well. 1. Choose a healthy looking stem and clip off about 2 to 3 inches of it (a part) using a knife. 2. You will notice that a callus has formed at the place of the cutting you clipped off. This callus will develop in a weeks time and helps offer a protective barrier to the plant against diseases and infections. 3. Once you see the callus on the cutting, its time for planting it in soil that is mixed with extra perlite. The steps mentioned above will surely help you in growing these beautiful plants indoors. But, if you still have some doubts regarding them, here are a few very important tips on how to grow succulents indoors. Do go through them carefully and you will understand why succulents are a favorite accessory for decking up the interiors of most houses. 1. Show as much sunlight to succulents as possible. Succulents thrive well when they get exposed to direct sunlight as they are accustomed to the heat when they grow in arid areas. But, how do you make them get enough light? Well, if you have windowsills that receive good sunshine, then keep your succulent pots on them and in no time you will see your prickly and fleshy succulents growing perfectly. Also, if you have a porch or a balcony, place your pots outside for a few hours when the sun is at its peak and let them absorb lots of Vitamin D.
2. Always select pots that have drainage in them or are unglazed. 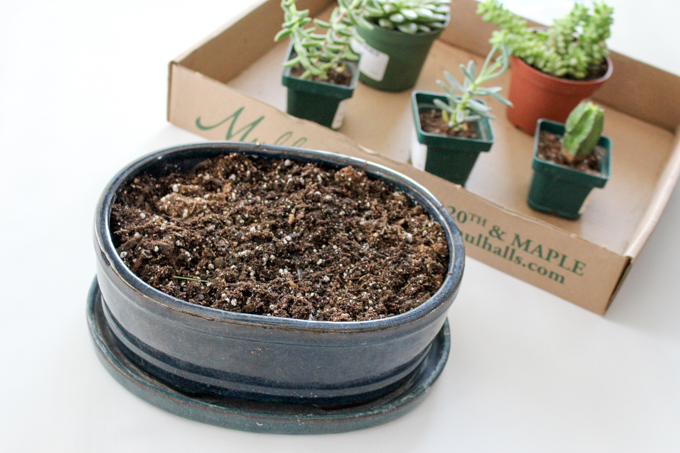 Doing this will ensure that your succulents get enough air to breathe and the soil doesn’t get clogged up. Do not choose dark colored pots as these may absorb more heat and can cause damage to your succulents. 3. Always pick such succulents that appear green. Green leaves in a succulent are a direct indication of it being healthy and a happy plant. If you choose grey colored ones and keep them indoors, you will eventually see that these are not growing properly. Same is the case with other colored succulents like purple and blue. 4. Never over water your succulents. These plants belong in the desert and can tolerate heat but will die if you over water them. Too much water can mar their growth and block their pores. 5. Refrain from dehydrating your succulents. Its a good thing if you do not over water your succulents as this will cause them to decay and die. But, this doesn’t mean that you never treat them with water. Most succulents, if not watered properly will die. Water only in limited quantities. Also never water continuously for two days at a stretch as the succulents need their soil to get dried before you water them again. 6. Choose the best indoor succulents that will likely survive indoors. Some of these include Crassula Jade, Burro’s Tail, Aloe Vera, Hens-and-Chicks and Christmas Cactus. 7. Do not over crowd when planting succulents indoors. Most varieties of this desert plant thrive well in spaces that are big and not cramped. So, make sure your pots are not crowded with too many succulents. 8. Mix and match when growing succulents indoor. You can plant different varieties together provided they have the same kind of needs and grow at the same time. 9. Fertilize only in summer when the succulents are growing at a fast rate. Winter is a resting season, so don’t fertilize. You can use an organic fertilizer and use it on succulents at least three times in a week. But don’t over feed them. Succulents can add an artistic touch to any room or corner of your house, and believe us, these plants are one of the easiest to maintain. With fleshy leaves and stems, succulents can take lot of neglect, but this doesn’t necessarily mean you don’t have to care for them at all. Hopefully this article has been helpful in guiding you all to give a try to planting these babies at home. If you still need more help on how to grow succulents indoors, do come back to us for more queries.